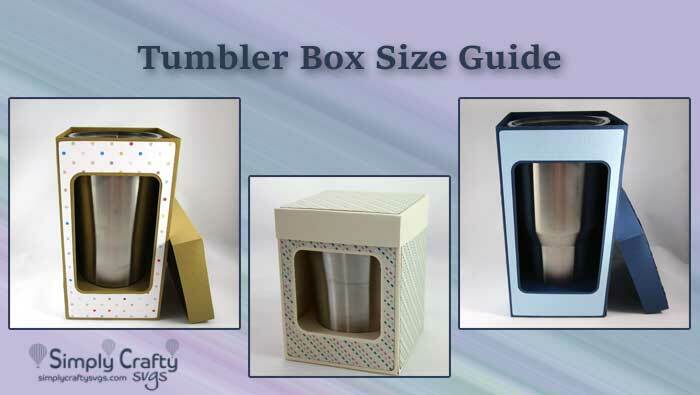 Here is a guide showing you the different Tumbler Box SVG files we currently sell and the common tumbler sizes that fit within them. 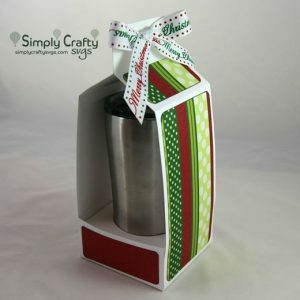 Just for clarification, these boxes are great for displaying personalized tumbler creations, but are not a shipping box. Make sure you check the dimensions of our boxes ensure your tumbler will fit prior to purchasing the files. 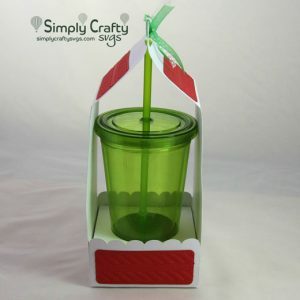 Click here to view all our packaging SVG files…for wine glasses, mugs, mason jars and more! It is recommended to use 80 LB or greater weight cardstock or cover. Most refutable brands will contain this information on their packaging. Two of the brands I regularly use are 80 LB American Crafts Textured Paper from American Crafts and 110 LB Neenah cover cardstock for designs that are sized to cut on letter-size. See product details for each SVG file for size compatibility. The panels are optional but do strengthen the box, if added. The Small Tumbler Box SVG file is sized to hold a 10 ounce Ozark or other similar insulated tumbler no larger than 3.6″ diameter and 4.75″ tall. 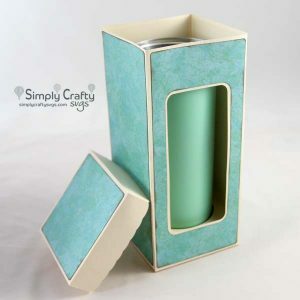 The box itself is 4.85″ tall by 3.75″ square. Insert is included to hold the tumbler in place. 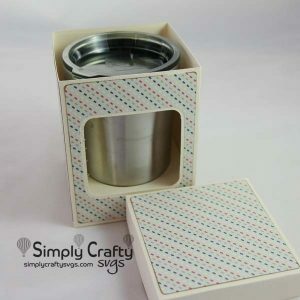 The Small Tumbler box SVG file for for the 12 oz mini tumbler is sized to hold a 12 ounce insulated tumbler no larger than 3.5″ diameter and 5.4″ tall. The box itself is 5.5″ tall by 3.55″ square. Insert is included to hold the tumbler in place. 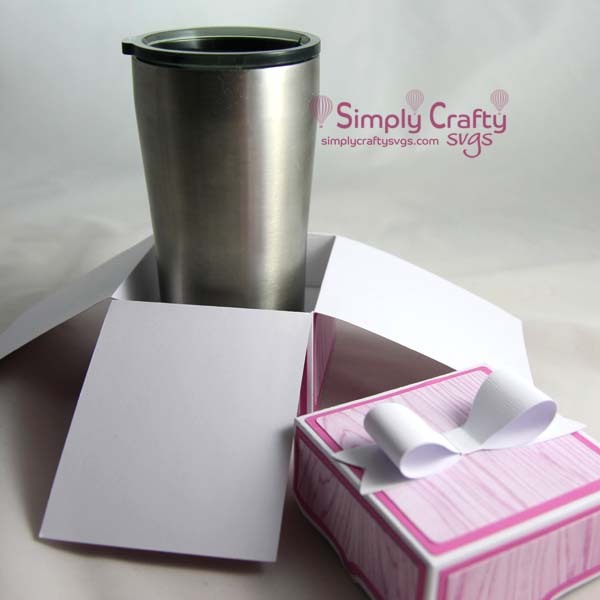 The Medium Tumbler box SVG file is sized to hold a 20 ounce Yeti, Ozark or other similar insulated tumbler no larger than 3.6″ diameter and 6.9″ tall. The box itself is 7.1″ tall by 3.75″ square. Insert is included to hold the tumbler in place. 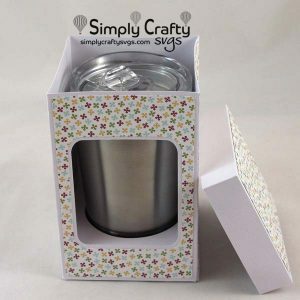 The Medium Tumbler Explosion Box SVG file is sized to hold a 20 ounce Yeti, Ozark or other similar insulated tumbler no larger than 3.6″ diameter and 6.9″ tall. The box itself is 7.1″ tall by 3.75″ square. 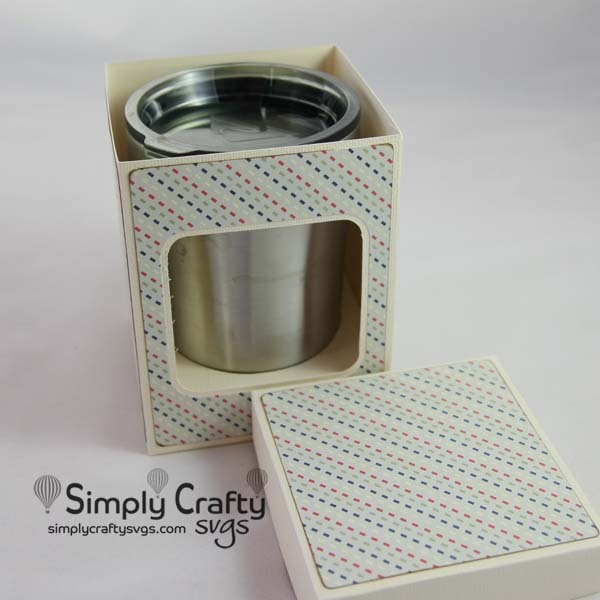 When you lift the lid, the top portion of the box sides fall down to reveal the tumbler. Click here to see this in action in the assembly tutorial video. 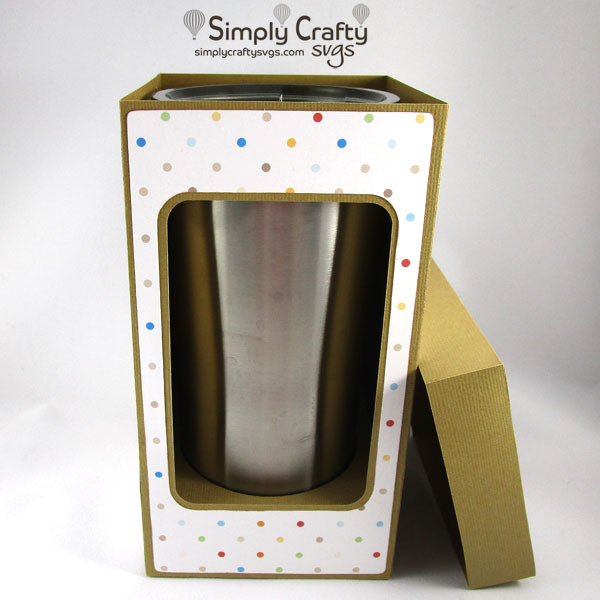 The Skinny Tumbler Box SVG file is sized to hold a 20 ounce Built Skinny insulated tumbler. 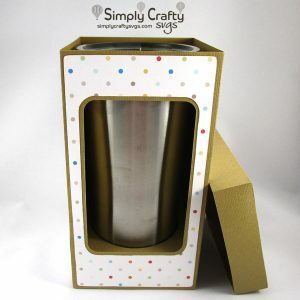 It also fits thinner skinny 20’s tumblers or other similar insulated tumbler no larger than 2.8″ diameter and 8.25″ tall. The box itself is 8.3″ tall by 3.7″ square. Insert is included to hold the tumbler in place. Prior to creating any other of the tumbler boxes, we designed this Tumbler Holder SVG file that will hold a 20 ounce Yeti, Ozark or other similar steel insulated tumbler no larger than 3.6″ diameter and about 7″ tall. It will also hold a standard 16 ounce acrylic insulated tumbler with straw. Insert is included to hold the tumblers in place. It is not strong enough for a 30 ounce insulated tumbler. 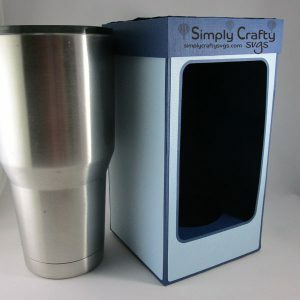 The Large Tumbler Box SVG file is sized to hold a 30 ounce Yeti, Ozark or other similar insulated tumbler no larger than 4.1″ diameter and 7.9″ tall. The box itself is 8″ tall by 4.15″ square. Insert is included to hold the tumbler in place. The box is sized to hold a 30 ounce Yeti, Ozark or other similar insulated tumbler no larger than 4.1″ diameter and 7.9″ tall. 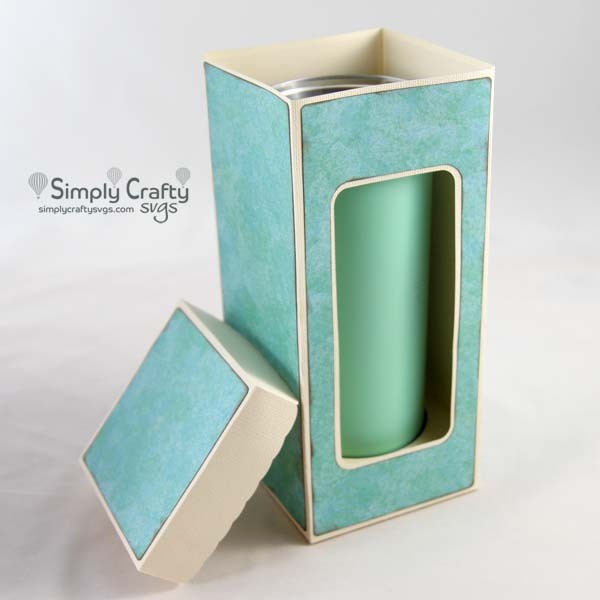 The box itself is 8″ tall by 4.15″ square. Insert is included to hold the tumbler in place. 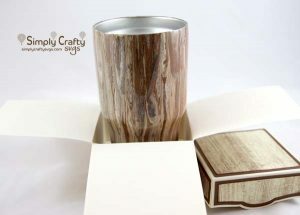 As with the Medium Tumbler Explosion Box, when you lift the lid, the top portion of the box sides fall down to reveal the tumbler. Click here to see this in action in the assembly tutorial video. 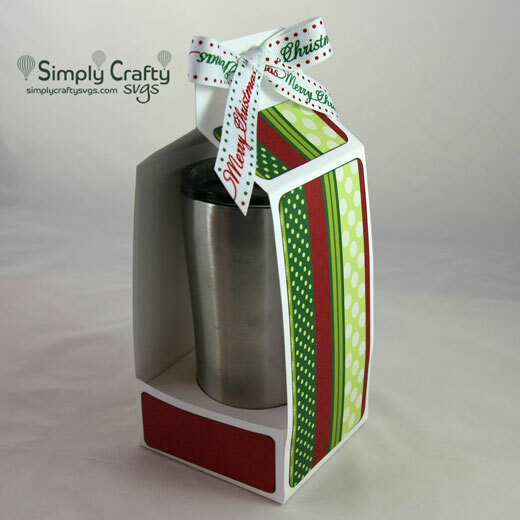 Click here to view our entire selection of Tumbler Box SVG Files.